Fresh off the back of John Jastszebski’s celebrated ‘Work EP’, D’Julz’s Bass Culture Records returns with a unique and varied double A-side featuring collaborations between Berghain mainstay Ryan Elliott, label regular Alex Picone and the ever-influential Analogue Cops. After catching The Analogue Cops playing alongside Picone as their live outfit, Hands Up, in Ibiza this summer, label boss D’Julz felt resolute in signing some tracks, and so the ‘Five EP’ was born. The release brings to light these artists’ true weight and resonance in today’s scene, with the A-side showcasing Ryan Elliott and The Analogue Cops’ true ear for a modern techno gem and the B-side presenting Alex Picone and The Analogue Cops’ live credentials. A siders ‘Gentlemen’ and ‘Homeboys’ take listeners to the very depths of bass with low end fuzz, the subtlest hint of dub and a percussive swing welcomed at any hour on the dance floor. ‘Out of Passion’ and ‘No Stress’ go deeper still, with a true sense of liveness to the drums, heart-grasping basslines and sensual undertones. 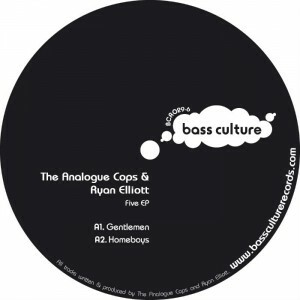 With this exciting set of collaborations on the ‘Five EP’, D’Julz and his always on point Bass Culture are set to start 2013 as they mean to go on with this exciting January release. This entry was posted on December 21, 2012 at 10:30 and is filed under Release.